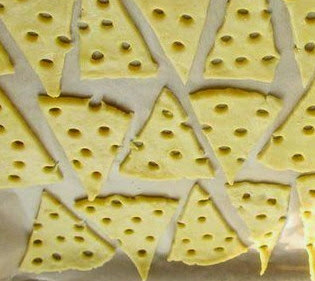 For the preparation of cheese crackers we need cheese, butter, flour, egg yolk 1 egg. Chop the cold butter with knif with flour. Then mix the yolk gently, mix everything and gather the dough into a ball. Wrap in the foil or pack and put in the refrigerator for 30 minutes. Then, the dough will need a little more to the mixing uniformity. Divided the dough in 2 parts. Roll the each dough into a circle. Make random holes the Cocktail straw, like cheese. Bake the crackers for 10 minutes at on 180 °C. Now represent Very tasty crackers with sweet coffee, and just as good with beer.